These all colour parts of the plot in a way that is quantitatively significant, and the Aux Axis control gives you a chance to control the details of the value-colour mapping, and to display the mapping in a colour ramp displayed beside the plot. Some other layer types (e.g. Density mode) also shade the plot according to numeric values, but use their own colour map, and don't display the colour ramp. If no layer is using the shared colour map, then this control will not appear in the stack. When present, this control has three following tabs. Select the colour map from a list of options. Select a sub-range of the full colour map above. 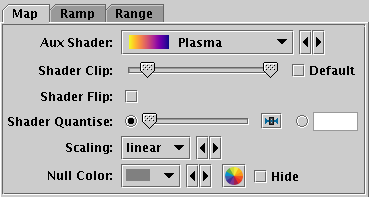 If the Default checkbox is checked, then all or most of the colour ramp from the Shader control is used. If you want to configure the range of colours from the map yourself, uncheck the Default checkbox, and slide the handles in from the end of the slider to choose exactly the range you want. The default range is clipped at one end for colour maps that fade to white, so that all the plotted colours will be distinguisable against a white background. That is generally a good idea for scatter-type plots, but may not be so good for plots where the whole plotting surface is coloured in, like density maps or spectrograms, so in that case you might want to uncheck Default and leave the handles at the extreme ends of the slider. Whether the aux scale should map forwards or backwards into the colour map. Allows the colour map to be quantised. By default, the colour map is effectively continuous. If you slide the slider to the right, or enter a value in the text field, the map will be split into a decreasing number of discrete colours. This can be used to generate a contour-like effect, and may make it easier to trace the boundaries of regions of interest by eye. Determines the function used to map the range of aux data values onto the colour map. Options are linear, logarithmic, square and square root. What colour should be used to represent points with a null value for the aux data coordinate. If the associated Hide option is selected, then those points will not appear in the plot at all. Whether the aux scale ramp is visible; if so an appropriately labelled colour ramp appears at the right of the plot. The associated Auto option makes this decision automatically: if any aux data is plotted, the scale will appear, otherwise it won't. Deselect Auto if you want to determine visibility by hand. Selects the axis label to be displayed near the aux colour ramp if it is visible. The associated Auto option, if selected, uses the name of one of the coordinates supplying aux data; deselect Auto if you want to enter a label by hand. The slider influences how many tick marks are drawn on the colour ramp. The Range tab lets you enter lower and upper values for the aux data range by hand, and provides a double slider to restrict the range within these limits. If either the lower or upper range is left blank, it will be determined from the data. The Lock Aux Range checkbox controls whether the aux range is automatically updated as the plot is adjusted (for instance as you navigate around it with the mouse). If locked, the range will stay the same, but otherwise (the default) it is dynamically updated for the current view of the plot. This checkbox is a duplicate of the toggle button on the plot window toolbar described in Appendix A.4.2. Note the font used for labelling the aux axis is currently controlled by the font from the Axes selector.